Without a shadow of a doubt, the single most sybaritic moment of my life was spent lying up to my neck in a steaming hot bubble bath, with rose petals floating on the surface, an ice cold gin and tonic close at hand, a full-length picture window at my feet. The view? The clouds at sunset chasing across the Ngorongoro Crater. The place? The Ngorongoro Crater Lodge after a long hot dusty day gameviewing in an open jeep down inside the crater. The day, the game-viewing, the bath and the panorama were all sublime. The conservation area stretches far beyond the rim of the crater across the rolling grasslands right to the borders of the Serengeti, covering 8,094.4 sq km (3,125.3 sq mi) in all. It also includes the world-famous archaeological site of Oldupai Gorge. But it is the giant volcanic caldera – the largest still intact in the world – that holds everyone’s attention. Formed 2-3 million years ago, its steep, forested walls are 610 m (2,000 ft) high and the flat grassy floor is about 20 kms (12 miles) across and covers 260 sq km (100 sq miles). Also on the crater floor is a soda lake, Lake Magadi. As you descend into the enclosed arena it is like entering Conan Doyle’s Lost World (with added tourists – this is definitely on the beaten safari track). There are said to be over 30,000 animals living within the crowded crater, including the Big 5, making it some of the most densely populated wildlife territory in the world. There are also over 600 species of bird within the conservancy. The wildlife sightings are superb and unusual. I saw hyenas hunting as a pack and a pride of lions then chasing them off to take over the kill. Totally the reverse of normal behaviour. The Masai are allowed to graze and water their cattle in the crater but must leave each night. It is nearly perfect, losing only a single point because there are so many other tourists there which takes away a little from the wilderness experience. For most safari tourists in northern Tanzania the Ngorongoro Conservation Area essentially means the Ngorongoro Crater. This world renowned extinct volcanic crater covers a simply enormous 260km sq and is the largest intact volcanic caldera on the planet, but visitors don’t come here merely for the geology (although first views of this crater, from one of the viewpoints as you drive into the park, will leave you speechless) but for what has to be, alongside the nearby Serengeti, the greatest wildlife show in Africa. The floor of the crater is a flat carpet of lush grasses and eternal pools of fresh water and this has attracted animals in their thousands including all of the Big Five. It’s been said before but driving down the tightly forested crater walls onto the floor of the crater itself really is like entering a lost world and while you’re driving around down here the animal action comes on pretty much non-stop. But there’s so much more to the Ngorongoro Conservation Area than the crater and, sadly, most visitors, dazzled with wonder at the wildlife show of the crater floor never really notice or take advantage of the rest of the conservation area. In total the conservation area covers over 8000km sq and takes in a number of other volcanic calderas as well as soaring volcanic peaks some of which are still hissing, steaming and bubbling away, there are large areas of tangled forest through which monkeys swing and colourful forest birds flit, there are high altitude grasslands grazed by zebra and the cattle owned by the local Maasai communities and, at its western end the conservation area slopes gently down to the golden grass seas of the Serengeti. It’s here, on the borders of the conservation area and the Serengeti National Park, that life begins in earnest. In the Olduvai Gorge half the history of ancient human-kind has been uncovered. Fossilised remains and stone tools from some of our earliest hominoid ancestors have been discovered littering the ground here and the gorge and surrounding areas can rightly claim to be one of the birthplaces of humanity. Other births also take place close to here because this is the wildebeest calving grounds and every year between about January and March tens of thousands of wildebeest move into this region to give birth while a stream of predators take advantage of the seasonal glut of food. To see these calving grounds crowded with wildebeest is a spectacle that, in my opinion, even exceeds the action on the crater floor. For me another huge feather in the bow of the Ngorongoro Conservation Area is that long hikes can be made through the cold and spectacular crater highlands and, because the Maasai still live here in a fairly traditional manner, there’re lots of possibilities for cultural interaction. All up the Ngorongoro Conservation Area offers an almost unsurpassed combination of wildlife viewing, scenic beauty, adventurous walking and human interest. Sure there will be plenty of other tourists and vehicles bumping and bouncing around inside the crater with you, but there is good reason for this: Ngorongoro is an incredible wildlife area. If you are allergic to crowds and the thought of joining the safari hordes makes you quake in your proverbial boots, then this might not be the best destination for you; but, for everyone else, this will surely be the safari experience of a lifetime. This is a Big Five reserve that offers so much more … The views from the lodges perched on the crater rim are superlative, a vast array of wildlife carpets the floor below and, while on safari, the backdrop of lush green walls climbing skywards is jaw-droppingly impressive. I saw elephant bulls here that must be amongst the biggest tuskers in all of Africa; when they stopped to relax, they simply dropped their heads and rested their long tusks on the ground! It’s not unusual to see lion, cheetah, elephant, rhino and a host of other species in a single drive here. First-timers will love this place, but Ngorongoro Crater should blow even the most hardened and experienced safari goers clean out the water. (Apart from its popularity, my only other negative comment would be that like most other Tanzanian reserves, this is a game drive only park and the lack of alternative safari activities might disappoint the more active and energetic safari goers). 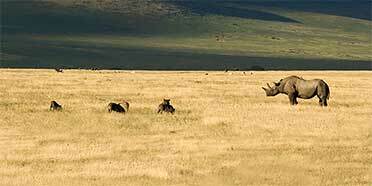 Ngorongoro Crater is expensive, but the scenery, and the density and variety of the wildlife, are unparalleled. With its quintessential East African vistas awash with wildlife, and surrounding landscapes graced by the local Maasai, it is one of the most unique and rewarding places on the continent for wildlife watching. I highly recommend it as a destination, especially if it’s your first safari. The journey to Ngorongoro is half the fun, climbing up first through patches of forest to the crater rim, and then descending into the crater itself. On clear days, the views from the rim are breathtaking. Plan your visit for as early in the morning as possible to minimise crowds and to take advantage of the more favourable morning light. Once in the crater, all of the 'Big Five' are present, including the usually elusive black rhino. You'll also almost certainly see hyenas and hippos, and the birding is wonderful. Once away from Ngorongoro Crater, the rest of Ngorongoro Conservation Area offers fine hiking and stunning terrain. STAMPED like a giant hoofprint in the green mountains of Masailand, Ngorongoro Crater is a must-see destination, and that first view from its rim will take your breath away. Looking down into the void 500 ft below you see the crater floor mapped with sunlight and shadow, a lost world measuring 11 miles across. Down there live thousands of wildebeest, zebras, buffaloes and lions, along with some of Africa’s biggest tuskers and a handful of black rhinos. Sadly, Ngorongoro has become too popular for its own good and a day is all you’ll need here. Even then, it’s a good idea to avoid the lunchtime picnic spots, and ask your driver to take you across the Munge River. It’s usually quieter on the other side. For guaranteed solitude, take a trip to Empakaai or Olmoti craters in the conservation area. Better still is a mobile safari starting in the Ndutu woodlands and heading out towards the Gol Mountains. The plains and kopjes around Lemuta Hill are stunningly beautiful and there is nowhere I would rather camp than at the foot of Nasera Rock. From here you can drive down the valley of Angata Kiti to look for cheetahs on the Salei Plains in the shadow of Ol Donyo Lengai – the Masai holy mountain. At 19km across and up to 600m deep, Ngorongoro Crater is one of the largest unbroken calderas in the world, and the view from above is one of the most stunning vistas in Africa. It’s one of the few places I've visited where seeing pictures or video before seeing the real things did nothing to diminish the magic of the moment. But, it’s not the scenery that makes Ngorongoro the most visited destination in Tanzania, it’s the unrivalled abundance of wildlife inside the crater; in particular predators, for which this is the highest density of any single spot in Africa. Even more thrilling is the high likelihood of seeing black rhino. This would make for a relatively easy Big Five day if it weren’t for the fact that Ngorongoro’s leopards mostly stick to the forested fringes of the crater and are rarely seen. From a safari standpoint, the rest of the park is pretty much just what you have to pass through on the drive to Serengeti National Park, except for the January to March migration season, when the famous herds of wildebeest, zebra, topi, eland and more roam down the conservation area’s western edge. But besides wildlife, Ngorongoro is an excellent trekking destination and also home to over 40,000 Maasai, plus the Oldupai Gorge, where many important fossils of early human ancestors have been found, cuts across the west. I felt completely spellbound on my first trip to Ngorongoro Crater. The rim was shrouded in cloud but as we descended the 600 metres down to the crater floor, this vast caldera opened up before our eyes absolutely teeming with animals – a truly spectacular vista. 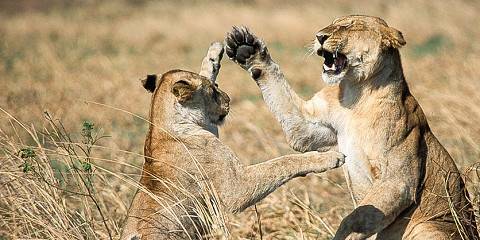 Roughly 30,000 animals share the 260 sq km of verdant grassy plains, including all the Big Five. Giraffes however are absent, mainly because there’s little food for them at tree level but also because the rim is said to be too steep to descend. It’s almost a Disney-esque scene here – the wildlife is so used to humans, it can sometimes seem totally unconcerned by us, although this isn’t necessarily the case and care should be taken not to cause distress. The downside is the number of tourists in safari vehicles that want to do exactly what you’re doing. They can be avoided by going very early in the morning or by visiting in the wet season, provided the roads are passable. At times it may appear that tourists outnumber the animals, but nonetheless Ngorongoro is an essential stop on Tanzania’s northern circuit and one I certainly wouldn’t miss. With its steep crater walls forming a natural barrier it is quite literally a veritable Garden of Eden jam-packed with just about every species of African wildlife you can imagine including all of the big five and the elusive endangered black rhino. This makes wildlife viewing ever-so-easy, but it of course also means you’ll rarely escape the tourist herds. My best advice is to plan your trip very early in the morning so you can get some private game viewing in before the crowds arrive. The vista from the crater rim is simply stunning, so make sure you stop en route to soak it all in. When you arrive down on the crater floor not only will you be gobsmacked by the sheer mass of wildlife, but with the volcanic landscape so rich and fertile, you’ll be amazed to see the Maasai still herd their cattle while prides of lion roam close by. Over-touristed or not, the Ngorongoro crater should be on the itinerary of every first time visitor to Tanzania. This is one of the most amazing wildlife places in Africa and, yes, you’re not the only one who wants to experience it. The extinct volcano is a scenic delight with grassy plains, lakes and a fever tree forest. The forested crater walls are a great backdrop for photographing wildlife inside the crater. The volume of wildlife is amazing and this is one of the best places in Africa to see black rhino. My tip to avoid the crowds is to get to the gate as it opens, to get down the crater as early as possible. Most people only leave after breakfast as it isn’t practical to return to the lodge on the crater rim for lunch. Therefore, most people will take a packed lunch and thus have breakfast in the lodge. So, take packed breakfast and packed lunch and you’ll find you’ll almost have the crater to yourself for that magical time during sunrise. Ngorongoro crater is only one of several extinct volcanoes in the conservation area. It is worthwhile to stay another day and explore the whole area. Accompanied by a park ranger, you can explore the scenic Empekaai crater with its flocks of flamingoes on foot. The centrepiece of this reserve is the Ngorongoro Crater, arguably Tanzania’s ultimate safari destination. This is the world’s largest intact caldera, and one of the most scenic places anywhere in the region. Coming from Arusha, as almost all safaris do, I always stop as I reach the forested crater rim to absorb the spectacular view over its 260 sq km floor, which supports a cover of open grassland interspersed with fever tree woodland, marshes and the saline Lake Magadi, which usually supports large flocks of flamingo. 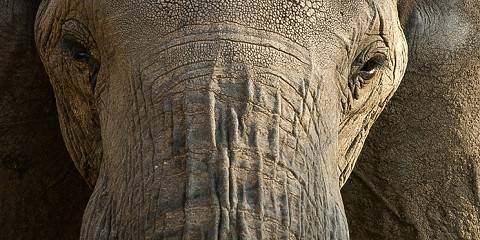 Wildlife highlights include the heavy-tusked elephant bulls that haunt the swamps, and a small population of the rare black rhino, which is regularly seen in open terrain. There are also astonishing densities of spotted hyena, lion and other predators. The most common criticism of Ngorongoro is the dense tourist traffic, particularly straight after breakfast, and there is no getting around the fact that the high volume of tourists in a relatively confined area diminishes the crater’s wilderness feel. On the plus side, it also means that the wildlife is exceptionally habituated, which makes it an excellent place to watch uninhibited animal behaviour at close range. I would wager that anyone who has been to Ngorongoro Crater will never forget their first view of it from the rim some 500 feet above: the dense green forests, the saline Lake Magadi coruscating in the sun at the heart of it, the myriad colours and contours of the crater’s walls and floor. Inside the walls of this extinct volcano there are a staggering 25,000 mammals in an area roughly half the size of Cape Town. As you descend along the windy track from the top of the rim, tiny black dots will gradually become vast herds of buffalo, zebra and wildebeest stretching across the flat crater floor. There’s probably nowhere in Africa you have a better chance of seeing the Big 5 in a single game drive. At one point on our first drive inside the crater, there were 3 young male lions passing close to our car on one side, four big bull elephants on the other, two black rhino dead ahead and a spotted hyena behind. More than once inside the crater I didn’t know which way to look. The crater has a reputation for being over-crowded with tourists but when we were there it was surprisingly quiet – Tanzanian tourism has taken a considerable knock in the past 12 months thanks to terrorism across the border in Kenya and (misinformed) concerns about Ebola. There’s probably no better time to visit this incredible feat of nature. The Ngorongoro Crater is a paradox: either enormous or tiny, depending on how you look at it. On the one hand, this extinct caldera is impressive for its sheer size, with 269 sq kms of savanna crater floor and a vast backdrop of looming crater walls. On the other hand, the almost unnatural profusion of game within these walls, plus the density of safari vehicles crisscrossing the crater floor to gawp at it, can create the impression of an enormous animal enclosure. Here the wildlife is literally wall-to-wall: zebra, wildebeest, buffalo, gazelle and other grazers munching the grasslands in every direction, with the highest concentration of large predators in Africa stalking them, plus huge elephant bulls in the forests, hippos and flamingos in the lakes, and even a few rare black rhino. None of these highlights escaped us, during my one long drive into the crater. We even had a pride of lions using our vehicle as shade, and – a real bonus – watched two leopards cross the road as we set out from our campsite on the crater rim. It left me thinking that if you had only one day in your life – indeed just one afternoon – in which to experience African wildlife, then this would be without question the place to go. But if you were then granted a second day, you might chose to try somewhere else; some place where you could lose the crowds and feel more of a sense of discovery. Don’t forget, though, that the crater itself is only one part of this World Heritage Site: there is plenty more wildlife beyond its walls and also, perhaps just as impressive, the famous Olduvai Gorge, cradle of our own species. Ngorongoro is everything you would expect, and there’s a staggering amount of game, which is so used to the army of minibuses with camera-touting tourists poking out the top, they practically stand to attention. I’ve had some amazing animal encounters here – black rhino and buffalo have nodded their heads politely, elephants have casually thrown back their heads to shake their giant tusks, a leopard jumped down from a tree in the middle of the day and padded past swinging her hips, and a whole pride of lion casually ambled over and flopped down in the shade of our minibus, their whiskers grazing the glass of the hurriedly shut windows. Admittedly a safari here is about taking a photo and moving quickly on to the next, and I prefer the larger and slower-paced ecosystem of the Serengeti, but you can’t beat watching the animals’ magnificent stage presence in Ngorongoro. Set at the foot of the Great Rift Escarpment, Lake Manyara is small enough to see in a day but deserves a longer stay. The park itself is a long, narrow strip with the escarpment on one side and the lake on the other, and begins with a beautiful expanse of ground water forest frequented by bushbuck, blue monkeys and swallowtail butterflies. Elephant are common – this is where Iain and Oria Douglas-Hamilton lived and wrote their African wildlife classic: Among the Elephants. But Manyara’s top attractions are its flamingo flocks and tree-climbing lions. Flamingos and pelicans you should see for sure. This is altogether a terrific park for birding. But in six visits, although I have seen plenty of lions, I have never seen one reclining in the big overhanging acacias. The farther you drive the more the quieter the park becomes. A lot of visitors don’t even make it as far as the Endabash River, so it’s well worth pushing on to Maji Moto Kubwa Hot Springs, even though you have to come back along the same route. As close to guaranteed big 5 sightings as you can get outside a zoo! The first view of the great Ngorongoro Conservation Area from the edge of the crater is one of those African experiences you will never forget. And from the drive down into the crater onwards the experience just seems to keep getting better. By 11am we had already seen lion, elephant, rhino, buffalo (a herd of close to a thousand! )...and shortly after lunch we saw a leopard resting in a tree. The big five within about 5 hours has to be some sort of record! Sometimes, a place is popular because of hype and a visit proves to be a disappointment when compared to the expectation. And sometimes a place is popular because it deserves to be. Ngorongoro undoubtedly fits into the second category. Sure it can get busy, and a lion is easy to locate thanks to the jeeps that inevitably line up for a viewing, but the wildlife watching opportunities, the knowledgeable guides and the sweeping views of the ancient volcanic crater make this an unforgettable animal encounter. Vistas are unbroken by trees or undergrowth and for me, the clear sight of a trio of elephants gently plodding towards a water hole hundreds of metres away will always be the lasting image of my visit. The Ngorongoro Crater is, alongside the Serengeti, Tanzania’s superstar park, and it’s a well deserved title. The ‘crater’ (technically a caldera) is breathtaking - a 160-square-kilometre circle of bush and savannah surrounded by a ring of steep hills, giving it a truly otherworldly feel. Within the ‘crater’ itself, there are grasslands, woods, swamps and small lakes, inhabited by all Big Five species and hundreds more besides. I love the fact that only male elephants live down here, and if you come in spring you’ll get to see them wading appealingly knee deep in bright yellow beitens flowers. The game is extremely habituated to vehicles, and the lions in particular barely raise their heads on the approach of an engine. Its relatively small size and huge popularity means that the Ngorongoro ‘crater’ area is often crowded with Land Rovers, following each other in convoy around the limited network of roads and queuing up to see the big-ticket animals, a habit that really got on my nerves on my last visit, especially when the visitors insist on talking at the top of their voices – why don’t their guides tell them to shut up? It’s still worth a visit though, and I suggest you aim to get in as soon as the gates open in the morning to minimize the crowding. It was my childhood dream to see the Ngorogoro Crater, and I feared it would not live up to my expectations. However, it spectacularly exceeded them – truly taking my breath away. I realise this is a well-worn phrase, but the Ngogorgoro Crater should be on everybody’s Bucket List. Having said that, of course the disadvantage are the queues of vehicles snaking down the crater access road. Try and stay in a lodge as close to the descent road as possible and get up early, to be near the front of the queue in the morning. But it is so worth it, descending into the Eden-like bowl, full of wildlife. It feels like entering Jurassic Park. There is surprisingly great wildlife too, with lots of big game including lion and cheetah, a lake rimmed with flamingo and one of the best places in Africa to see the endangered black rhino. There’s nowhere on earth quite like Ngorongoro. Looking out over (or descending down into) this vast crater soon after dawn is like experiencing the Africa of childhood imaginings, a place where human beings are very much secondary. It is the umbrella acacia silhouetted against the deep green of the crater’s steep walls. It is the 30 black rhinos that range across the valley floor. And it is the daily battle between lion and hyena (with both black-backed and golden jackals never far away) in their pursuit of prey. In fact, in my experience, this is one of the easiest places in Africa to see hunts and/or predators on a kill. It is that combination of staggering wildlife densities and views of staggering beauty surrounding the austere salt lake in the crater’s heart that make Ngorongoro one of Africa’s most rewarding safari experiences.